The accent piece that can make or break your current decor scheme. Consider this a must for the small-space! Its defined detail coupled with a solid composition and structured make, earmark it as an essential. Psst! It can even pass off as a desk. When it comes to nightstands or side tables, this one couldn’t be more untraditional. Its contemporary composition plays to the essentials of the piece’s form, proving that style means no compromise on function. Offset the rigidness of an exclusively contemporary piece by opting for a warm wood finish. The result? An accent piece that can seamlessly exist within a variety of decorative styles and schemes. Because if you’re going to hoard a year’s worth of your favorite glossies, you may as well display them in style. This Scandinavian-inspired side table is beautifully structured and so refreshingly simple. Its bold pink shade, an added bonus! A modern decorator’s dream! This multi-faceted side table channels sleek, geometric design and couples it with a warm jewel-tone that’s both lustrous and elegant. This small-space essential virtually blends in with its background, displaying only an ever-so-subtle hint of its contemporary shape. Pair against a dynamic backdrop to really showcase the composition of the piece. These stunning pieces may err towards the more artistic side of things (versus the more functional side tables we may have at home) but they certainly have us coveting one, or both. We can’t get enough of the structured details of this table, which pays a subtle tribute to Scandinavian design. Framed by a vibrant pop of color of a primary palette, this ultra mod piece is a work of art. We always love a good item that comes with a double duty function. 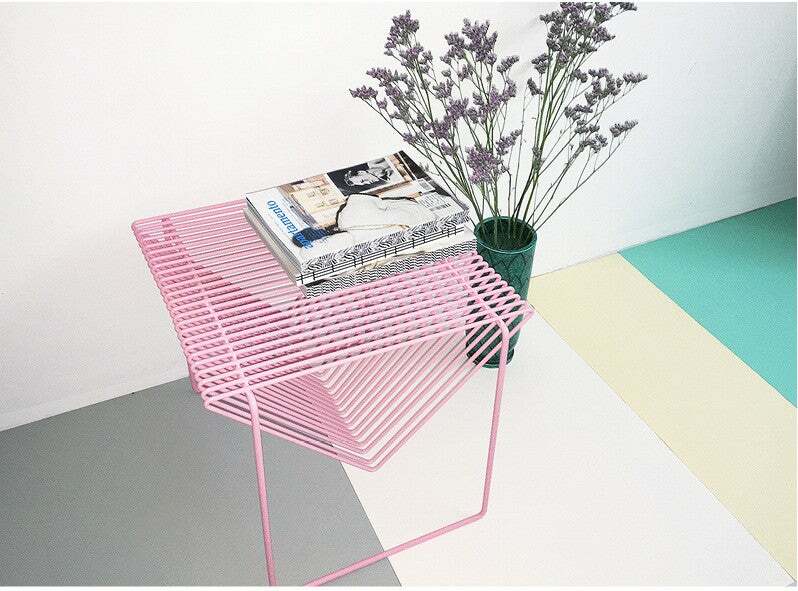 Featuring a built-in tray, this bold and bright side table is the accent piece your space was missing.